Media and News — Shamini Jain Ph.D. In this TEDx talk, Dr. Shamini Jain questions what healing really is, reviews findings that help us to demystify the placebo effect, and calls us to action to bridge models of medicine for a deeper understanding and application of healing. What is the biofield and how does it relate to consciousness and health? In this interview with Sounds True founder Tami Simon for her “Insights at the Edge” Podcast, Shamini explains her perspective on consciousness, the biofield, and how leading from a consciousness and biofield-based framework will help solve major global health issues such as chronic pain. Listen to Shamini’s whole podcast with Tami Simon. Dr. Jain was interviewed for this award-winning documentary on the power each of us has to influence and change the world through our thoughts, emotions and actions. In this talk for the UCSD conference in Integrative Oncology, Shamini shares current scientific understandings of the effects of biofield therapies (such as Healing Touch and others) in cancer patients, and notes some of the controversies associated with the study of biofield therapies. In this short guest interview for Marilyn Schtliz's Consciousness and Healing course, Shamini explains placebo from a consciousness-based perspective, and suggests five ways to incorporate the science of placebo for our own health and healing. In this article, which explores energy healing as a treatment for grief, Dr. Jain explains to Prevention Magazine why her randomized controlled trial with hands-on-healing for fatigued breast cancer survivors suggests that healing appears beyond a placebo effect. Read the full article HERE. 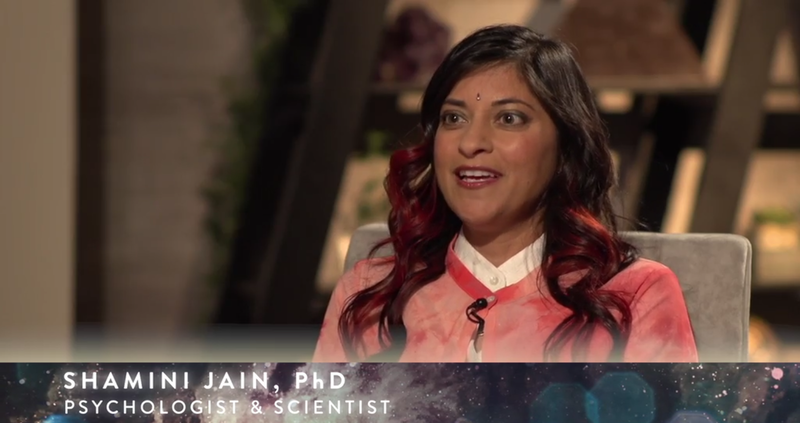 Shamini was recently featured in GAIA TV’s “Open Minds,” where she talked with host Regina Meredith about Jainism, the power of collective consciousness and the Power of We research conducted by her nonprofit, the Consciousness and Healing Initiative. Click HERE to watch a preview of the full video. In this keynote talk given at the Academy of Integrative Health and Medicine in 2015, Dr. Shamini Jain discusses key scientific findings in the field of placebo research, proposes a new framing of placebo, and discusses how to implement "placebo" elements in clinical and daily practice. Slides are shown on the left of the screen, with Dr. Jain on the right. Can we take our study of meditation further? In this talk, given at the Institute of Noetic Sciences, Dr. Jain relates ancient Vedic yogic principles behind meditation, and explores how we can utilize these principles to further our scientific inquiry of meditation beyond "stress reduction." Dr. Jain speaks with US News and World Report on the science behind energy healing. Dr. Jain was interviewed by US News and World Report on what Grounding is and whether the science behind it is valid.